April 29, 1985, 16:02:18 UTC. Space Shuttle Challenger ignites its solid rocket boosters and launches mission STS-51B into space. On board is 53 year old Lodewijk van den Berg, Dutch born but American citizen since 1975. He is an expert in crystal growth, a research domain interested in space because of the microgravity conditions that enable crystals to grow without gravity defects. Just one of the many good reasons to go into space is that it provides an exceptional environment for production of purified materials for the medical, defense and semicon sector. 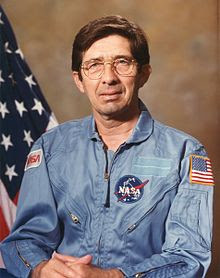 Just before his colleague André Kuipers was launched into Space on April 19, 2004, the Dutch television program 'Netwerk' paid attention to Lodewijk van den Berg, the 'forgotten astronaut'. He is relatively unknown to the Dutch general public as he lived for many decades in the US. Again this year, there is the connection between André Kuipers and Lodewijk van den Berg. On November 7, Lodewijk van den Berg will talk at the TEDxDelft event in the TU Delft Aula congress centre whilst Andre Kuipers is just moments away from his 2nd spaceflight to the International Space Station. The exact starting date of his 6 month journey is now just a little unsure as a similar rocket on which Andre Kuipers was launched, was lost on August 24 with its unmanned cargo aiming to supply the International Space Station. I learnt from a tweet by Michel van Baal, the TU Delft media communicator and a rusty rocket expert, that the manned version of the Soyuz rocket (Soyuz-FG) uses newer RD-0124 engines on stages 1 and 2 of the rocket, compared to the RD-0110 engines used on the ill fated Soyuz-U launcher. The third stage is identical however, and the problem seems to be in this stage. We'll have to wait and see what the investigation team comes up with. See below, an infographic on Russia's Progress Cargo spacecraft and how it compares to other systems.